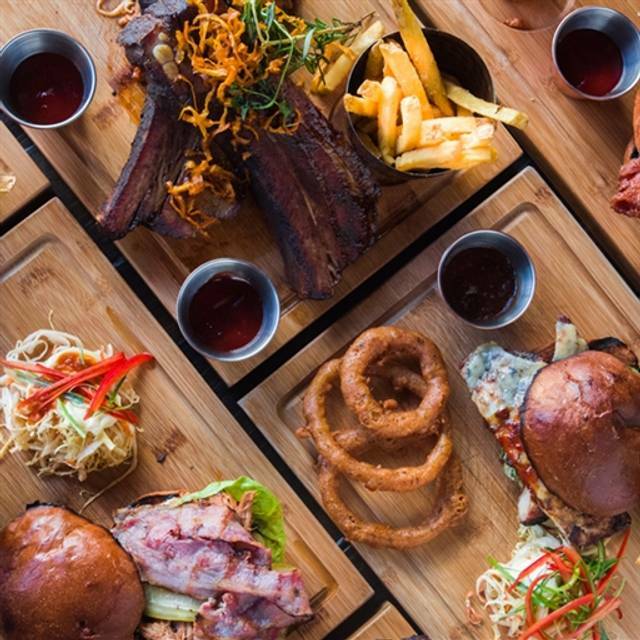 Welcome to Cattle & Co. We aim to deliver the best of grilled and smoked barbecue food. 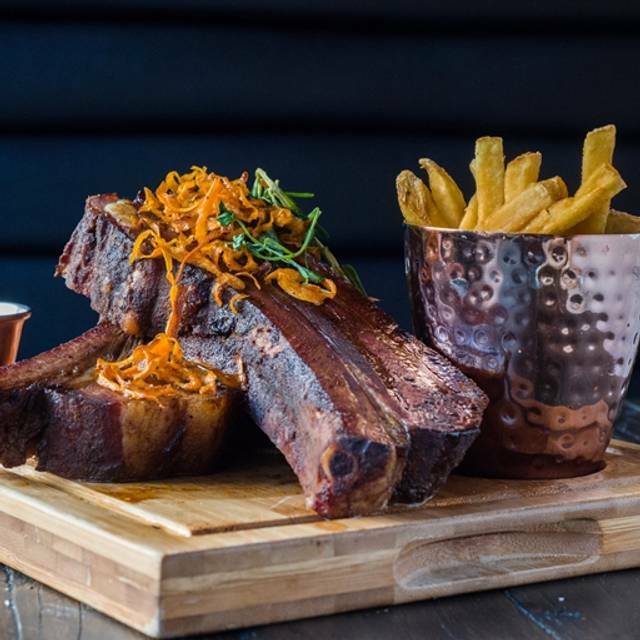 Sourcing the best of British produce coupled with the craft of low & slow cooking we hope to serve up sumptuous barbecued meat in a relaxed and friendly environment . To compliment our food philosophy, we have developed a detailed list of custom, barrel aged cocktails (or the classics) & selected 150+ bottles of liquors . Be it gin, rum, bourbon or a single malt we should have something for you. The first stop on the adventure to Flavourtown. w. Mixed leaf & Herb oil (vegan alternative available). Seaweed, Cajun & Lime and Garlic. Chefs hot sauce and Chargrilled lime. Scotch bonnet & Garlic marinade with Cheese, Honey & Beer onion rings & Your choice of Fries. (May or may not come with a personal oral fire extinguisher). The House Burger. None of that sad burger nonsense you've seen appear in the last few years. Made fresh every morning from Grain fed Minced Beef with Applewood Cheddar, Gherkin, Coleslaw & Your choice of Fries. Bringing the art of real burgers back to the table. We may be a predominantly meat restaurant but that doesn't mean we've forgotten about you guys that aren't into that. Black, Kidney & Cannelloni Bean patty with Smoked Applewood Cheese served with your choice of fries. So good, you might finally be able to convert those carnivores at long last. 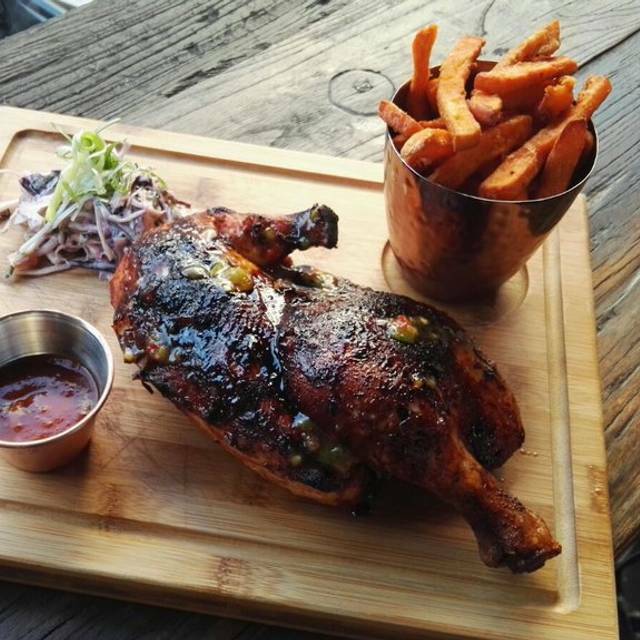 Hickory smoked for a minimum of 12 hours, Chefs Homemade BBQ sauce, Coleslaw & Your choice of Fries. The Cattle & Co Uppercut and Haymaker Combo. St.- Louis pork Ribs teamed up with our Pulled Pork, Slaw, BBQ sauce & Your choice of Fries. Heavyweight Division World Champ right here Ladies and Gentlemen. Gem lettuce, Croutons and a Soft boiled egg. Our take on a classic. A classic salad for you cheese fiends out there. Gem lettuce, Croutons and a Soft boiled egg. The realest. 'Slaw & Your choice of fries. 9oz Chicken & Beef patty (yes you read that correctly. 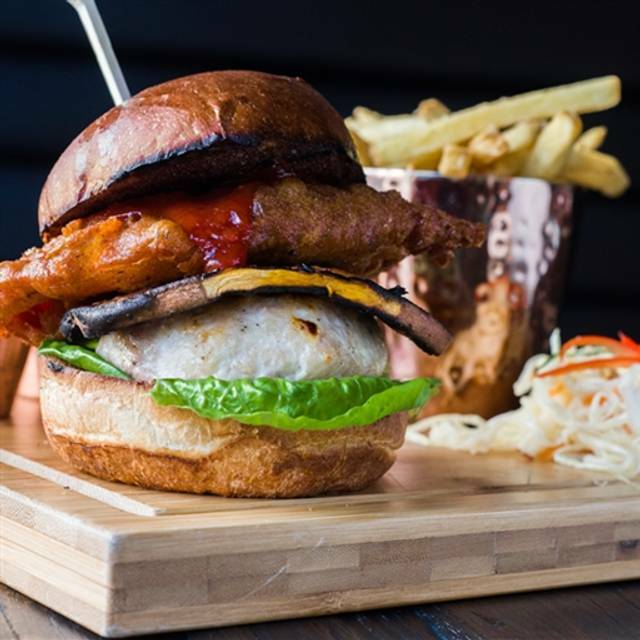 Think, delicious yin & yang and you're halfway there), Deep Fried Bacon & Your choice of fries served with 'slaw. Served with Tzatziki yogurt & Your choice of Fries. Variety is the spice of life. Changing the Southern Fried Chicken game, one burger at a time. with Jalapeno peppers & Your choice of Fries. 'slaw, Your choice of fries & Chefs BBQ sauce. Great for a Sunday roast alternative. Also great for every other day of the week too. Now we're talking. Our imported smoker really showing off its potential with this dish. Hickory smoked on-site for at least 12 hours (Low and Slow), Pickles, Sauce, and Your choice of Fries. No introduction needed. Garlic butter, Beer & Honey onions rings & Hand cut chips. Sorted. The formidable showcase of what we're about here at Cattle & Co. St Louis Rib, Beef Short Rib, Smoked Chicken Thigh, Honey & Beer onion rings, and in just in case you needed something else; Fries. A wheelbarrow taxi service home also available upon request. No judgement here, we've all been there. Served among a selection of Chargrilled Fresh Seasonal Vegetables and Your choice of Fries. Served rare and delicious. Do yourself a favour and put this in a burger. Hell, put in and on everything. Could not fault food. Beer good but prices high even for London. The place could do with a good clean of floor and tables. They put a service charge on for just 2 of us which I thought was rude. They only carried a plate to our table! Poor food and poor service but handy for Kings cross station. Food was delicious and big portion. I will be recommending the cool restaurant. Lovely food enjoyed the meal and drinks. Service amazing. The waiter we had was brilliant and provided my wife with a birthday gift. The waiter was very attentive and spoke to us about different events, shows and local ales which made it very personable. We wanted to share the cattle platter but unfortunately, being the day after Mothers Day, they were out of stock. This was a shame but we did have the pork platter which was very tasty. I would go there again and found the pricing reasonable and service excellent. I think the decor fits within the theme and is a very trendy place to go to. I would also advise kitchen staff to look busy even if earlier in service. We had a great dinner and service was excellent. Would highly recommend. Good service, great food, good value and tasty fresh food. Certainly for London prices and portions. No fish on the menu though. Which is fine because it’s a MEAT restaurant! We were very dissapointed when we were given the menu on arrival to find the two items my wife could eat due to allergies were on the on line menu but not on the menu we were given. The explanation was the menu had just changed ( not a good enough reason ) all menu's should have been changed. The food we ordered came the chips were hot but the rest of the meal was only just warm it had obviously been sat about waiting for the chips to be done. A very dissapointing experience. We had a wonderful experience at Cattle & Co! The food was amazingly well cooked but the star quality is really in the staff service. We were made to feel very welcome and received lots of help with the menu. Overall we were very happy and would definitely return. Already we are recommending to all our friends!!! Great place with great people running it. Lee was the man! Great service! The food was very delicious and the portions plentiful. Cocktails are also delicious and come at a great place, especially during happy hour. The service was good overall, however, a bit inflexible regarding a slightly larger group size than expected. Great food for meat lovers and well accompanied with excellent music. A place to go surely. The food we ordered on the menu was not what we received (we ordered steak and chicken and the platter had two cuts of pork). The chef came out and agreed that it was wrong but when it came to the bill he changed his mind. Eventually got a small discount as we were given much cheaper cuts, but such a shame they wouldn't admit their mistake and apologise properly. Won't go back. Lovely time and food was amazing. The pork combo was amazing had so much flavour! Don't be put off by the area.... it's slightly off Euston road sandwiched between a couple of convenience stores which might seem off putting at night. Food was really good. We both had the beef burger which is cooked to order and there's a great selection of fries and sides. The cocktails were a real hit. Cleverly named and delicious. Definitely order the fried chicken thighs - best I’ve ever tried! Service was nice, friendly and not over bearing. We had some really good burgers - pulled pork and chicken thighs on the other tables looked great too. Service was great too. Recommended very much. Cattle & Co was lovely! The music was great and varied. The waiter was super friendly and spent time talking to us too. Very welcoming! We visited Cattle it was conveniently close to the hotel we were stopping in. A year later, staying in London and wondering where to eat we remembered how much we enjoyed Cattle & Co and re-booked. A table for six was accommodated in the restaurant and, despite the service staff being very busy, we were attended to efficiently, effectively and respectfully. Nothing was too much bother, the food and drink were both excellent and we all left full and satisfied. I would gladly recommend a visit and am already looking forward to returning the next time I am in London. Food was bad. Burger patty was really over cooked and tasteless, bun was soggy and salad really poor. Chips were ok. I realised it was early and we were the only people in, but of you are open for service you are open for service! We were in a hurry and couldn’t raise all this at the time. Amazing Cattle burger! My only reservation would be the fries with parmesan & truffle oil. There was barely parmesan and they were too oily... I thought it would be a soft oily touch, not that much. A free drink or side wouldn't have gone amiss to make up for the inconvenience! First time coming here, and I will be returning. Food was great and good value for money. Lovely smokey smell and fantastic hand made burger. Onion rings are the best! Visited many times and never been disappointed. Good food very reasonably priced for location, good atmosphere and friendly service. Definitely visit again. Great food, lovely staff. Really good value. The shared meat platter was delicious! For two friends catching up it was just the right level of busy to be heard by each other but not the rest of the restaurant. The service was fun but attentive and the food plentiful, tasty and very reasonably priced. Nice casual restaurant close to Euston and Kings Cross stations. The pork and beef ribs were amazing. Chicken wings were very large, which meant not piping hot in the middle. But overall, a great little find. Great food, lovely staff and nice atmosphere. Price on short ribs could be a tad cheaper or add a few more affordable dishes that contain the short rib. Overall really good and will be going back again. Great food.. all really tasty and overall good value for money. More than a little disappointed. While service was good, the menu was different to that published online - all of the sea food options had been removed which was a key factor for choosing the restaurant. This disappointed my wife who is a pescatarian. We stayed because there was not much option at that point, so she chose from the sparse vegetarian menu. The cocktails were good and the chicken wings excellent, but the rest of the food was very mediocre with the ribs bordering on inedible. They tasted very much of paraffin or fire-starter fluid... not tasty at all. On the whole a middling experience. We won't be returning. Lovely restaurant with lovely staff. Cocktails are amazing and you can actually taste the alcohol. We had a lot of fun at this restaurant and the staff were so much fun expecially Lee. Great food, great portions, relaxing ambience but a little tired. They serve on wooden platters too, not ideal but it was still good. A fantastic find! I booked for a group of friends last minute, and the restaurant was really short-staffed. But the owner made us feel so,so welcome, and gave us free drinks by way of apology for a short wait for our table. We didn't mind the wait, because he kept chatting with us and did his utmost so that, by the time we sat down, our food was already ready for us. Outstanding service. Such a great find - we all loved this place, and the burgers! Thanks again to the owner. What a nice guy. 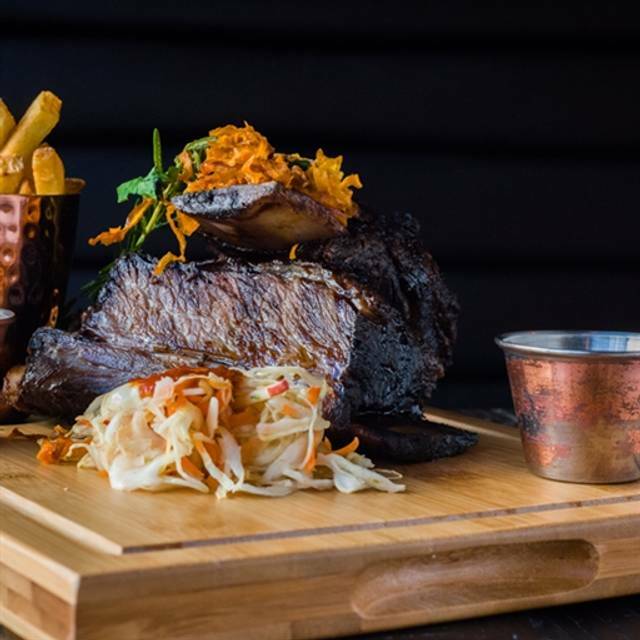 See Full Restaurant ListMake a reservation at Cattle & Co.